Imperia group launching soon new affordable housing project in sector 37C Gurgaon on 60m wide Road, near Gurgaon Dwarka Expressway Gurgaon. Imperia Ashira Sector 37C Affordable Housing is offering 1 BHK, 2 BHK flats in the approximate area of 5 Acres of land with represents the finest in contemporary residency by redefining style and elegance along with an aesthetic design for a sophisticated visual symmetry. The Project Imperia is your definitive stop to locate and purchase best affordable housing projects in Gurgaon under Huda Affordable Housing Policy. Imperia Affordable Housing Sector 37C Gurgaon offers all the luxury amenities you seek in a perfect home. i.e. Kids Park, Play School, Sports Club, GYM, elevators, Power Backup, Security System, Imperia Commercial Retail Sector 37C and much more are just the tip of the iceberg. Imperia Affordable Sector 37c Gurugram flats allotments will be done by lucky draw system in the presence of TCP Haryana. Draw Date and Draw Results of Imperia Ashira Homes Sector 37C Gurgaon will be announced by TCP Haryana. 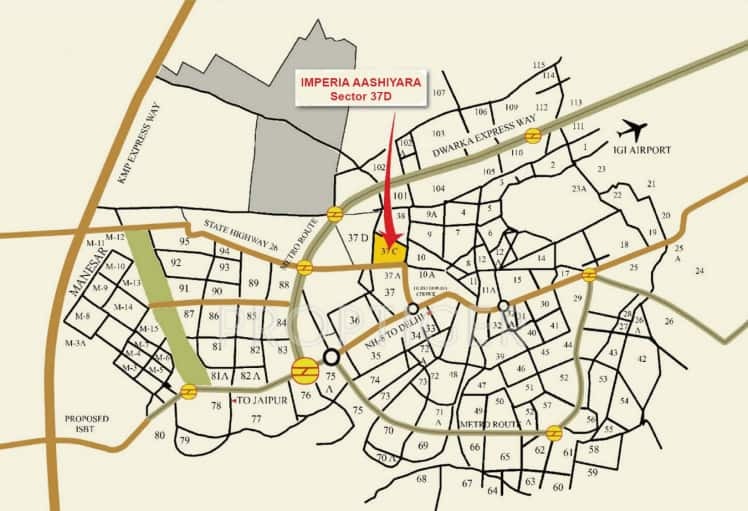 The upcoming project Imperia Ashira from Imperia group will be located in sector 37C Gurgaon at 60 meters wide road which is connected to two important roads of Gurgaon. The road connects the locality with Pataudi road and Dwarka Expressway Gurgaon. Living in sector 37C Gurgaon will help you have an easy access to the most important locations and destinations in Gurgaon and Delhi. At 60 meters and 24-meter wide road. 2Km distance from Gurgaon Dwarka Expressway. 5 minutes drive from NH8, Hero Honda Chowk. Surrounded by many residential projects of ILD, BPTP, Takshila, Ramprastha, Signature Groups. 20 minutes drive from Delhi Airport. Schools, Hospitals, Hotels, Malls, Multiplexes in close proximity. 5 minutes drive from the proposed Metro Station. No maintenance for 5 years after possession. Jogging Tracks, Yoga and Meditation Lawn. More than 50% Open Area. Retail Shops for Daily needs. Community halls for social gatherings. 100% Provision of Power and Water Back-up. Not needs to pay any extra EDC/IDC Charges all the charges are included in the Basic Sale Price.